Extend the wireless freedom of DECT and 900 MHz headsets to your UC system and manage softphone calls with any CS500 Series headset. The APU-75 provides PC connectivity with one-touch call control across a wide array of softphones. 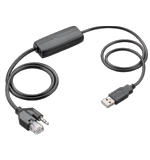 It is compatible with Plantronics CS540, CS510, CS520, CS530, Voyager Legend CS. * The APU-75 provides plug and play compatibility with Microsoft Skype for Business.